Cruz -- full name: Rafael Edward Cruz -- was born in Canada in 1970 because his father was working for the oil industry there. The senator’s birth certificate shows his mother was born in Delaware and his father was born in Cuba. The Cruz family left Canada a few years later. Cruz grew up in Texas and graduated from high school there, later attending Princeton University and Harvard Law School. By virtue of his American-born mother, Cruz, 42, considers himself a natural born citizen and eligible to run for president. So is he eligible? The vast majority of legal thought and arguments indicate he is. Cruz took the extra step of renouncing his Canadian citizenship, which he claimed he didn’t even know he had. Cruz, who imagines using his carefully crafted Washington outsider persona to propel him into the White House, has often frustrated members of his own party with what he describes as his stances against Washington and a broken federal government. Cruz is disliked on both the Republican and Democratic sides of the Washington beltway political aisle. His most noteworthy accomplishment in the Senate has been the October 2013 government shutdown. Undeterred, Cruz's response is that Republicans shouldn't fear a Government shutdown. Cruz’s strategy is use his outsider persona to reach across party electoral lines to appeal to voters who feel disaffected and forgotten by both parties, regardless of their past Republican and Democratic affiliation. Cruz is dismissed by many politicos as not having broad enough appeal to be a serious presidential contender. The Houston Chronicle reports that Greg Valliere, a political adviser to Wall Street firms, believes if Cruz did earn the nomination, he would not win more than a dozen states in the general election. "I don't consider him a mainstream candidate, and usually to win you've got to be inside the 45-yard lines," said Valliere. "The enthusiasm for him will be tremendous in maybe a third of the party, but another third of the party will be strongly opposed and another third of the party will be wary." Many Democrats joke they are delighted that Cruz is announcing as GOP presidential candidate saying he would be the easiest Republican to beat. Maybe so. If he doesn't expand his political base beyond the Tea Party, he surely is not electable in the 2016 general election. Even so, a March poll by the Wall Street Journal and NBC, found about 40 percent of Republican primary voters said they could see supporting Cruz. That puts Cruz a contender among the GOP presidential pack of Marco Rubio, Scott Walker, Jeb Bush, and Rand Paul. 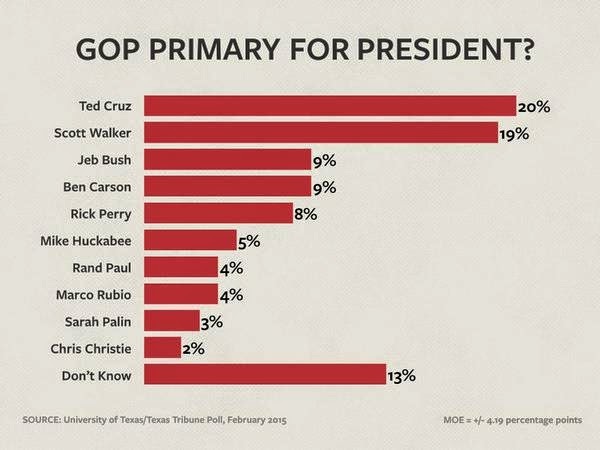 A February 2015 University of Texas / Texas Tribune 2016 GOP Tx primary preference poll puts Cruz in the lead at 20 percent, followed by Walker at 19 percent, Bush at 9 percent, and Perry at 8 percent. I believe there are four points of political reality that lead my fellow Democrats to underestimate Cruz's political future and viability as a candidate. First, he is generally seen as being too extreme on the issues. But we all know that this could be an advantage in the race for the party nomination -- and having a core and enthusiastic ideological base is, historically, a must to be successful in the general election. Second, Cruz is said by many Democrats to be too polarizing to be electable in the general election. I tend to agree. But we should not forget that despite his divisive 2012 Republican primary race against then Lt. Gov. Dewhurst for the U.S. Senate nomination, Cruz won that nomination against the better establishment-endorsed candidate who had a 2:1 funding advantage. Third, history should teach Democrats not to minimize the appeal of a Republican who seems too extreme, from a traditional liberal Democratic perspective, to win the general election among more centrist voters. Remember Ronald Reagan? 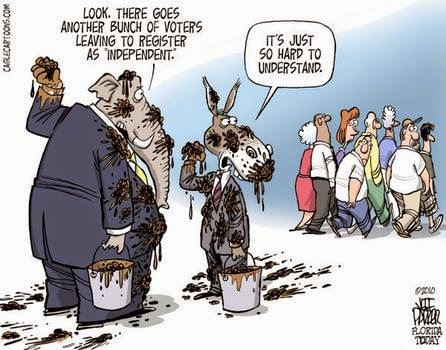 Finally, most active Democrats seem unaware of the pent up frustrations of the American electorate. Neither the Republican Party nor the Democratic Party are looked on favorably by even 40 percent of the American electorate. Recent findings from Gallup shows only 37 percent of respondents said they have a favorable view of the Republican Party. The Democratic Party fared slightly better at 39 percent. Yet, this is the first time since Gallup started tracking party favorability that both parties were below 40 percent at the same time. 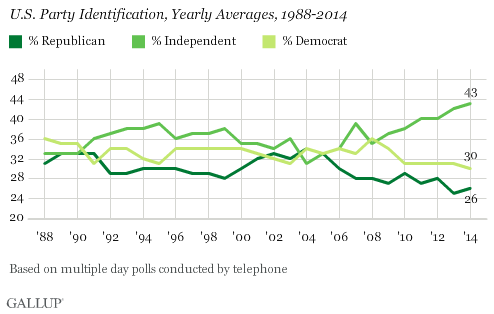 Another Gallup poll finds an average 43% of Americans identified politically as independents in 2014, establishing a new high in Gallup telephone poll trends back to 1988. In terms of national identification with the two major parties, Democrats continued to hold a modest edge over Republicans, 29% to 25%, as of February 2015. “For some time, numerous Gallup trends have been showing Americans largely displeased with government’s performance and leadership. Through it all, at least one political party was reviewed well. But during 1Q'15 — perhaps because of the constant brinksmanship played by the now Republican controlled Congress against President Obama — perhaps for other reasons — both parties are floundering.” - Gallup, March 16, 2015. 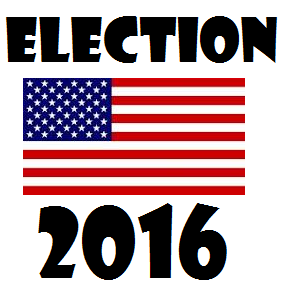 In April 2014, a Rasmussen poll found that a majority of Americans believe neither party represents America. This frustration among voters can be seen in other public opinion polls as well, such as congressional approval and the prevailing opinion that government is the biggest problem in the U.S.
Party registration also continues to plummet in many states as more and more Americans choose not to identify as either a Republican or a Democrat. Americans are frustrated, but they don’t see a light at the end of the tunnel. They have no hope that anything can change and as this disenchantment grows, people lose interest in participating in the voting process completely, which results in historic-low voter turnouts and creates a vicious cycle where nothing changes. That frustration is reflected in the General election voter turnout for the November 2014 midterms -- the lowest it's been in any election cycle since World War II, according to the United States Election Project. Just 36.4 percent of the voting-eligible population cast ballots on November 4, 2014. The last time voter turnout was so low during a midterm cycle was in 1942, when only 33.9 percent of eligible voters cast ballots. This type of political climate presents a ripe opportunity to for the extreme to resonate.